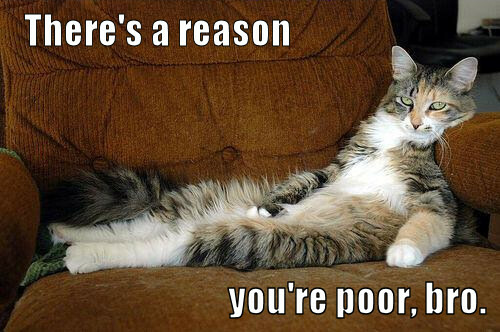 The Litter Box: Is Poverty Just Another Excuse That Some People Use In Their Daily Lives? Is Poverty Just Another Excuse That Some People Use In Their Daily Lives? We live in a third world country which is why I understand why it is common to see people building houses under bridges, near rivers, near railroad tracks and even on lands that do not belong to them. Street children are also common everywhere. Beggars and other homeless people roam the streets too in any time of the day. It's just normal to see people lying on the pavement with a small cup in front of them as if encouraging people to give them something as they pass them by. We see signs of poverty everywhere in this country and it's sad to think that it wasn't always like this. I've seen some people selling things on the sidewalk while others keep on riding different buses merely because they want to sell anything inside their food baskets. These people do their best to earn an honest living despite the fact that some of them are disabled, old or even uneducated. They may not be earning a lot or even enough but at least, they are doing something to make a living. I wish all people who suffer poverty do not dwell on what's obvious too much. Yes, we all know that you are poor so why keep on drawing emphasis to it? Will that help you improve your way of living somehow? I think not. Sometimes when you watch the news, all that you can see are people on rallies defending their rights and their beliefs but some of them don't even know what rights and beliefs they are fighting for. Most of them are just there to participate so that they can get paid. Other people though, know what's going on but don't realize that rallying all day won't change a thing. Sure it will cause a lot of noise and attention for a while but what comes after that? It will just be like nothing happened and they will all go back to their poor lives. What a shame! I've seen and heard people complain about how sad and poor their lives are. They complain about almost everything without even realizing that there are other people who have suffered or who are suffering more than them. If only they will stop complaining and start doing something about their lives instead? There are plenty of jobs everywhere. You just have to do your best to find one and get one. If you know that it's tough for you to even get a job then don't be choosy. As long as it's an honest way of earning money and your salary will be enough to keep food on the table then go for it. Lower your expectations and your standards. You are not exactly the cream of the crop here. Live your life accordingly. You are not a rich person so why pretend to be one? If you can't afford something then don't buy it. It's as simple as that. Do not push yourself too far by pretending to be something that you are not. Be contented with what you have. Aspire for more but work hard for it. That way nobody can ever tell you that you're just another loser thinking about silly things that you will never have. I wish poor people will stop playing the blame game so that they can have an escape goat for almost anything and everything. The government isn't the reason why you guys are poor, you made yourself that way and you will stay that way forever if you keep on blabbering about everything without even thinking about stepping up and doing what it is you have to do accordingly. The government is not responsible for every single person in the country. It merely does it's best to be responsible for everyone but the fact remains that we should all help out so that we can help ourselves. I'm sick of everybody using poverty as just another lame reason as to why their lives are so crappy. Stop being cowards and do what you have to do. You are all capable of doing more than what you are doing right now. Do not waste your time, your energy and your opportunities. We can all fight poverty but only if we will all do our best to stop being conquered by it. Poverty only happens to those who let it happen to them. Let's stop poverty by doing it is that we have to do. Let's stop being dependent on other people and let's start becoming more independent. Let's stop whining and start working. We all have the power to chance our destinies and we all have the power to change how we live our lives. Why not wield that power and use it? So that poverty will be crushed and will be heard of no more. Let's all stand up against poverty. Do more, think more, talk less, complain less. Most of the time, it is people's outlet not to work. Oh well, I am sick and tired of telling people too that they can do something to improve their lives. I always say, it isn't our fault if we are born poor but it is if we die poor. :))Wonderful post dear! Thanks girl! I just want everybody to know that poverty is not just a lame excuse that some people can use to excuse themselves from work and to be privileged enough to pin the blame on other people especially on the government. If they truly want to be successful with their lives then it's up to them to do it. Not everybody stays poor forever. It just takes time, patience and perspiration that's all.